(PRLEAP.COM) The newest addition to the Celestial Buddies Galactic Gang is Our Precious Planet (MSRP $24.99), a large (9" diameter) detailed version of Earth designed to help start a conversation about climate change and global warming. Consistent with the Celestial Buddies mission to both enlighten and delight, this Special Edition Buddy is a gentle introduction to a very complicated but also very important subject. Jon Silbert, VP Sales of Celestial Buddies, explains, "Our company understands that there are many factors that contribute to climate change. 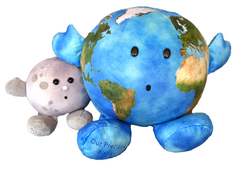 There is enough concern, however, about the human contribution to global warming that, as an educational toy company, we wanted to provide a way for families and educators to help promote healthy discussions with children about this important issue."